It started out as a bit of a joke. 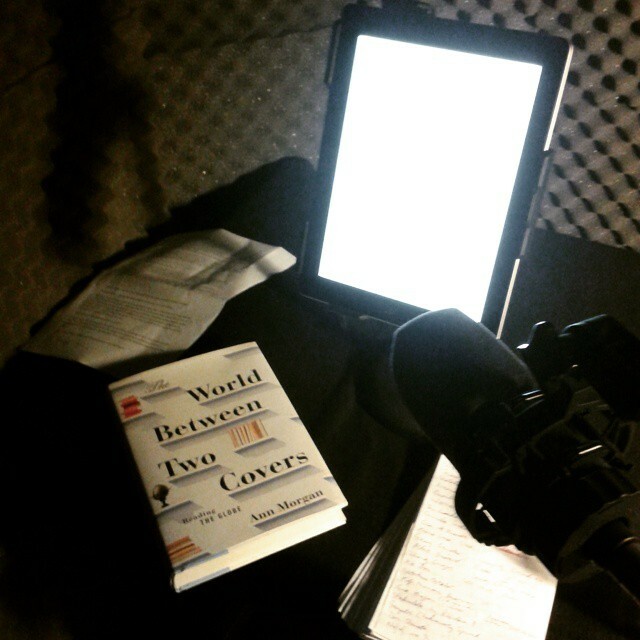 Shortly after I heard that my US publisher Norton had sold the audio rights to The World Between Two Covers to Audible, I received an email from the producers, asking what sort of actor I thought would be suitable to narrate it. Amused, I posted the query on Facebook, whereupon lots of friends started pitching in with (often rather tongue-in-cheek) suggestions. Then someone said I should put myself forward. Then another person said it. And another. Pretty soon the comment thread was full of friends telling me to ask Audible to let me do the narration myself. At first, I didn’t take the idea seriously. I’m not an actor and, being married to someone who trained as one, I’m only too aware of the skill and effort that goes into reading something engagingly. It seemed arrogant to suggest that I should be the person to take the job on. I might never have thought any more about it had another friend, author Carrie Gibson, not got in touch. She said she wished she had opted to narrate the audioversion of Empires Crossroads, her history of the Caribbean, herself. The actor had done a fine job, but listening to it now, she didn’t feel the book sounded like her. She thought I should go for it. I looked back at the email from Audible. In the small print towards the end, there was a section that said the producers did consider authors to narrate their own work for certain kinds of (mostly non-fiction) projects. I doubted they’d look twice at me. Apart from anything else, I was based on the wrong continent. Still, feeling rather devil-may-care after all the Facebook banter, I decided I had nothing to lose and sent back an email saying that I’d like to be considered if they thought I might fit the bill. A few months later, I heard back from the producers. They were fixing up a studio for the recording in Archway, north London. Could I let them have my availability for June? That was when the panic set in. Oh crumbs. I was really going to have to do this. Luckily, my friends came to the rescue once again. Radio presenter Sara Mohr-Pietsch, who I know from university, kindly let me accompany her to a recording session. From this I learned the value of using hand gestures and smiling to get colour into certain words and phrases, as well as the importance of taking regular breaks. ‘You’ll find you do weird things when you’re reading,’ she said. In addition, several of the translators and experts who helped me when I was researching the project and book provided advice on the pronunciation of numerous words, names and phrases that I had only ever seen written down. And so it was that, last Wednesday, I pitched up nervously in Archway for my first session. I was shown into a foam-lined room not much bigger than a wardrobe, the light went on on the microphone and it was time to begin. Luckily, my producers Alys and Katie were very friendly and patient as I stumbled my way through those opening pages at the start of each session. More than once, I found myself cursing my writing as I faced yet another labyrinthine sentence guaranteed to tie my tongue in knots and have me gasping in its wake. Still, as time went on and I relaxed, the process became easier. Sara was right: it turns out the weird thing I do when I’m reading out loud is conducting myself with my left hand. It seemed to help with getting some of the meaning across, however. By the end of the first hour or so I was starting to enjoy myself. This was helped by the regular communal breaks that brought together all the actors and producers recording books. On the first day, I found myself chatting over a cup of tea with someone engaged in narrating lengthy battles between dwarves and elves for a fantasy novel. The next morning, a grey-haired actor told me about the gothic story he was reading: set in Victorian times, it centred on a scientist engaged in swapping around people’s brains. By the end of the second session, we had seven out of 12 chapters in the can and I was rather tired. Still, it had been a lot of fun and I was enjoying the opportunity to narrate my words myself. I’m back in the studio to finish the job later this week. Fingers crossed my voice holds out! Very cool. Good for you to break beyond your comfort zone again and find something you enjoy. Great idea. Listening to the audiobook of my novel was a strange experience. The woman who recorded it was wonderful, and I don’t have a single complaint about the way she did it, but when I write I hear my words in my head. In my voice. So hearing them in hers was very, very strange. Yes, that must be a strange experience indeed! Nice job giving it a go! I especially like the part about talking with the other voice actors 🙂 It seems like you’re characters taking a break from being characters to have lunch. I’ve seen pictures of actors in full costume at a film set stopping for a lunch break, and it’s always funny. I was just reading yesterday something about the editing process, a suggestion that it is a very good idea to read one’s entire work aloud and I was thinking how tough that would be, but how beneficial. Even if you’re doing it after the fact of publishing, I am sure you are learning something important that will inform your future writing projects! Well done on putting yourself forward, I think it’s wonderful that you’re doing it, especially for such a personal and inspiring journey. Thanks Claire – I certainly find it helps. I read all my work (even blog posts) out loud before I declare them done. It often helps catch things my eye alone wouldn’t pick up on. The experience in the studio certainly adds another layer though! This is amazing. Glad you were able to put yourself out there in another big way. I just found your blog today and I am glad I did. Great blog!